Disclaimer: This article provides general information only and does not constitute medical or definitive safety advice with respect to working in extreme heat. You should always consult with your doctor before working in extreme heat conditions. You should also consult with your local news and government weather source for any heat advisories or extreme heat alerts in your area. There are weather conditions in which it is too hot to work, however each roofer and employer must determine when to reschedule their work based on the heat stressors in their specific conditions. Staying cool while roofing can be a challenge. Demand for roofers is high in the summer; so roofing professionals often have to work the hottest days and without shade. That presents a few challenges. For example, how do you stay cool in the summer while roofing? If you own a roofing business, how do you keep your employees cool and safe while they work in the sun? We’ll address the latest information about how to keep cool while working outdoors. We’ll also discuss which beverages are best to drink when working in the heat (for example, there is new research about whether coffee is a good idea.) Plus, we’ll discuss new research that has blurred the line between heat exhaustion and heat stroke. And, there are new products on the market to help you keep cool in extreme heat. Below are IKO’s summer heat safety tips. The first step to staying cool while roofing is to know your weather conditions. Before you set out for the day, you should look up the weather so you can plan appropriately. OSHA’s Heat Safety Tool App has all of the weather information American roofers need. Canadians can use the Weather Network App, which provides temperature and Humidex rating. You should expect a more challenging day as the temperature outside meets or exceeds body temperature because this makes it more difficult for your body to cool itself. You should also pay attention to humidity, because in high humidity your sweat evaporates slowly, which prevents your body from cooling as effectively. 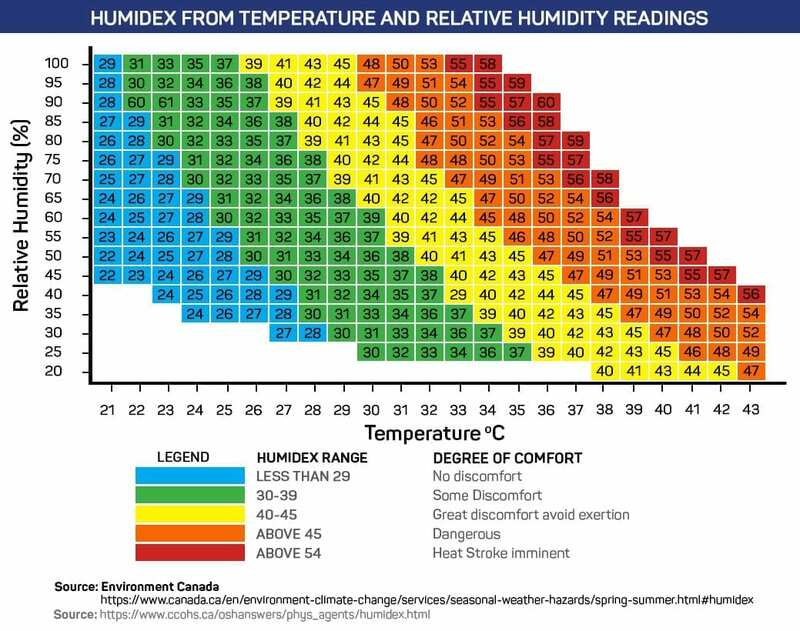 The Canadian Centre for Occupational Health and Safety (CCOHS) considers a Humidex rating of 30-39 to be uncomfortable, 40-45 to be greatly uncomfortable, and above 45 to be dangerous. On the other hand, very low humidity is also a problem, as it allows your sweat to evaporate too quickly, which could contribute to dehydration. In low humidity conditions, you will need to keep a closer eye on your hydration levels. Before heading out to work, consider whether the temperature is too high to work. The National Institute for Occupational Safety and Health (NIOSH) recommends temperatures at which work should be rescheduled, but it’s not just about temperature. NIOSH also takes into account a variety of factors including humidity, sun exposure, workload, air movement, and the roofer’s age and health. A healthy, hydrated worker under 40, who is roofing in normal humidity (30 percent) in the shade is cautioned to stop and reschedule work at temperatures of 41° C or 106° F. NIOSH makes recommendations for all lines of work, so their baseline recommendations don’t take into account that roofers almost never work in shade. However, the agency does tell us how to adjust for partly shaded and full sun conditions. In partly cloudy conditions NIOSH advises you add seven degrees to the outdoor temperature (in Fahrenheit), or 13 degrees in full sun conditions. Therefore, the same roofer with a heavy workload in full sun conditions should consider rescheduling work when the outdoor temperature reaches 33° C or 93° F.
Our second summer heat safety tip is to understand your materials and work surfaces. Metal flashing can become quite hot during the summer. It’s best to keep these materials out of the direct sun until you are ready to install them. You should also wear heavy gloves while you are working with any roofing materials in high heat. One of the best ways to stay cool while roofing in the summer is to plan for the layout of your roof itself. When the design permits, you should try to start on the west side of the roof at the beginning of the day, and work on the east in the afternoon, so that you can try to stay out of the direct sun. Note that the workers in the image below have completed the smaller roof plane in the foreground first because it is shaded. If you bring on new staff members during the height of summer, you will have to allow them to acclimate to working in extreme heat conditions. NIOSH recommends that a non-acclimatized roofing professional should work for no more than 20 percent of a usual workday on their first day. You can increase this time by 20 percent, maximum, every day until new workers are keeping pace with acclimatized workers. Some health conditions can make working in the heat more dangerous, including obesity, cardiovascular disease, diabetes, and even infections such as the common cold. Workers with these conditions, or who are taking prescription medications (which may affect their hydration or temperature), should discuss with their doctor if they can safely work in extreme heat conditions. NIOSH recommends you create a medical monitoring program at your company. Roofing professionals should get periodic medical evaluations and should have a plan to monitor their health while they are on the job. Plus, NIOSH recommends that all workers be educated about heat safety and the signs of heat illness. Also, all supervisors should be educated on understanding and planning for weather conditions. Your first thought when working in the heat is probably a desire take your shirt off. But, you’ll actually be cooler if you wear a shirt because it keeps your skin out of direct sunlight. Choose a light-colored shirt, bottoms, or even shoes, to reflect more of the sun’s rays. Also consider that breathable fabrics, such as cotton, will keep you cool in hot weather by letting you feel the breeze. Work clothing made from moisture-wicking fabric, which is often used in athletic gear. This material keeps you cool by allowing your sweat to evaporate faster. Shirts with built-in air-conditioning can keep you very cool, although they do add weight and require a power source. Cooling vests that contain ice packs are a great power-free option, but the ice does tend to melt in two to three hours. Simply soaking an over-garment in cool water can also help you stay cool. You may be tempted to skip routine safety equipment in extreme heat because it adds weight and layers to your clothing. But, it is essential to continue wearing your safety equipment. Your workload should be reduced based on the amount of heat stress your safety equipment adds. Some of the equipment may even help keep you cool, such as a hardhat with a brim, which will keep the sun out of your eyes. The last piece of hot weather equipment you need is sunscreen. You should wear a chemical-based sunscreen on any skin that isn’t covered by clothing. It is best to apply the sunscreen 20 minutes before stepping into the sun. Using waterproof sunscreen can help prevent it from coming off with your sweat, but ultimately you will need to re-apply it after a few hours. To avoid gaps in coverage, do not use a spray-on sunscreen. Instead, use a liquid and “slather” it on liberally. As for which SPF you should choose, recommendations from researchers have changed. While experts once thought that any SPF over 50 didn’t give much additional benefit, new studies have shown that higher SPF formulas do protect from burns and skin cancer better than lower formulas. Sunscreen loses SPF over time (after being applied), but many people fail to re-apply it. If these people start with a higher SPF, the sunscreen will stay protective for longer. If you frequently forget to re-apply sunscreen, starting with a sunscreen with an SPF at or over 100 may help protect your skin. Regardless of what SPF you choose, the label should indicate the sunscreen is “broad-spectrum” which means it protects from ultraviolet A (UVA) and ultraviolet B (UVB) rays. You can plan your day wisely to stay cool while working in the heat. Many roofing professionals will start their day as early as light conditions allow, perhaps 7 a.m. in some locations, to avoid the heat and sun of the midday. Sometimes roofing professionals attempt to finish their work before the hottest part of the day even arrives. Once the temperature rises, you should take a water break every 15-30 minutes. Contrary to popular belief, taking your breaks in an air-conditioned environment will not reverse your acclimatization. You become acclimatized to hot conditions over a 7-10 day period, after which your body sweats and pumps blood more efficiently. You will only lose this acclimatization if you do not work in high heat conditions for a few days. If you were recently acclimatized, you can regain your advantages in 2-3 days. It’s also important that you don’t exercise before you arrive at work. Exercising before working in the heat could increase your risk for heat-related illnesses on the job. It’s better to assess your health after work and decide whether or not it is safe for you to exercise in the evening. The most important tip to avoid heat stroke is to remain hydrated throughout your workday. If you are dehydrated, your body will struggle to sweat and control its temperature, which can lead to heat illness. When you’re dehydrated, your heart will also have to work harder, because you have lower blood volume, which will make you less efficient. Don’t wait until you see the signs of dehydration, or even feel thirst, to drink water. You will lose a large amount of water through sweat while working and research has found that you will not become thirsty enough to naturally replace it all. So, replace your fluids by frequently sipping your beverage throughout the day, even if you do not feel thirst. NIOSH recommends workers in high heat drink 1 cup (8 oz.) of water or their fluid of choice every 15 to 20 minutes. Remember that it is typical for workers in high heat conditions to lose 6 to 8 liters (211 to 281 oz.) of fluid through sweat a day—all of which has to be replenished. Though people generally tend to believe that acclimatized workers will lose less fluid than unacclimatized workers, the opposite is true. Once you become acclimatized you will notice that you actually sweat more than you did at first, to compensate for the temperature and your workload. Though many believe sports drinks hydrate you more effectively than water, for most roofing professionals it is unnecessary to drink sports drinks for their electrolytes. NIOSH says that workers who eat regular meals and snacks will gain the necessary electrolytes from their food. Only during periods of extended sweating, more than 4 hours, may sports drinks be helpful to avoid heat stroke. If you are going to drink sports drinks, they should be diluted with water so that their concentration of salt and sugar is not more than 8 percent—or they will actually slow down the body’s absorption of water. The only workers NIOSH cautions may be at risk for hyponatremia (the medical term for low salt levels in the bloodstream) are those who are not acclimatized, those who are on a low sodium diet, or those who drink an excessive amount of water, which NIOSH defines as a liter and a half (52 oz.) per hour or more. Roofing professionals who are not acclimatized to high heat should be encouraged to add more salt to their meals for the first 2 to 3 days of work. Those on low sodium diets should discuss their needs with their doctor. All workers should be encouraged to drink water regularly so that they do not overload their body with a liter and a half (52 oz.) or more per hour. If hyponatremia is suspected, you should seek medical attention. Do not attempt to treat yourself, as treating this condition too quickly may actually cause serious damage to your body. Some roofing professionals consider using salt tablets to avoid hyponatremia, but this can be dangerous. Salt tablets interfere with hydration and should never be used by workers in high heat conditions—unless instructed to by their doctor. While previously researchers believed that those working in strenuous conditions should avoid caffeine drinks, including coffee, new research has suggested that coffee does not contribute to dehydration. A cup of coffee has mild diuretic effects, making you urinate more frequently, but it also provides you with some water. Coffee will not help you if you are dehydrated, and it could exacerbate heat stress, in which case you should drink water. However, there’s no reason to avoid your morning cup before work. There are several heat illnesses, ranging in severity from heat syncope to heat stress, to life-threatening heat stroke. This heat illness involves a very short fainting spell. The victim may also feel dizzy or lightheaded, especially if they have been standing for an extended period of time, or if they stand up suddenly. Heat syncope is most likely to affect dehydrated or unacclimatized workers. Working on roofs makes even momentary fainting very dangerous. Fall protection should be at the top of your mind, especially in high heat conditions. If you’ve suffered heat syncope, you should sit or lie down in a cool, shaded and air-conditioned area. You should slowly drink water or, if you prefer, a diluted sports drink. While you may feel better only a few minutes after regaining consciousness, complete recovery of your blood pressure may take hours. Heat exhaustion, or heat stress, is when the body is struggling to cool itself effectively. This condition will develop into heat stroke if left untreated. The signs of heat exhaustion include a slight rise in core body temperature to 38-39° C or 100.4-102.2° F. However, trying to identify heat exhaustion by taking a roofing professional’s temperature presents challenges. An individual’s tolerance for temperature varies widely. Some people may be unable to function at 38° C or 100.4° F, while others may remain functional even at much higher temperatures. Despite this variance, WHO has recommended that the oral temperature of workers in high heat conditions should not be allowed to exceed 37.5° C or 99.4° F. Keep in mind that your oral temperature may be inaccurate if you drank cool liquid in the last 15 minutes. You can also use your heart rate to estimate whether you are suffering from heat exhaustion. A resting worker’s heart rate should be falling, approaching baseline. Someone suffering from a heat illness will maintain a high heart rate even while resting. Seek medical care at a clinic or an emergency room. Bring the person to cool, shaded, air-conditioned location. Remove the person’s unnecessary clothing, including shoes and socks. Apply cold pad or cloth to the person’s neck, face, wrists and ankles. Encourage the person to take frequent sips of cool water (do not suggest they drink large amounts of water all at once). If cold pad/cloth is unavailable, have the person wash his or her face and neck in cool water. The line between heat exhaustion and heat stroke is not as clear as we once thought. Many roofing professionals were taught that the first sign of heat stroke is that you stop sweating, but it turns out that you can be suffering from heat stroke while you are sweating—this is called exertional heat stroke, and it is just as life-threatening as classic heat stroke. Hot skin, which may be dry or very sweaty. Immediately call 911 for the heat stroke victim. Always have someone stay with the person until medical help arrives. Move the person to a cool, shaded, and air-conditioned area. Remove the person’s outer clothes to help them cool. Apply ice packs or cold, wet cloths to the person’s neck, head, armpits, groin and ankles. Wet their skin and soak their clothing with cool water. Use fans to circulate the air around the victim. Because heat stroke affects the brain profoundly, victims may not recognize that they are in danger, or that they are behaving oddly. If you suspect someone has heat stroke, you should begin first aid right away, as once heat stroke occurs, the body’s temperature can reach hazardous levels within minutes. To protect from all of these heat-illnesses, roofing professionals should always work in pairs, so that they may monitor each other for signs of heat-illness. They should also have a phone with them, so they can call for help when needed. Lastly, new research is always uncovering new strategies for you to stay safe while working in high heat. Be sure to receive and update heat-related training, including first aid training frequently. That ensures a safer working environment for everyone. IKO has many more resources for the roofing professional. You can learn more about avoiding workplace injuries, or about other safety issues, such as those around torch-down roofing.